Claire Seneviratne - Ceramic Artist: Small smoked fired vessel with gold. How I smoke-fire my work. Video 1. Smoke fired pot with gold lustre. Video 2. Ceramic Pot with overlapping shapes and suspended circles. Video 3. Round smoke-fired porcelain pot with gold lustre. Video 4. 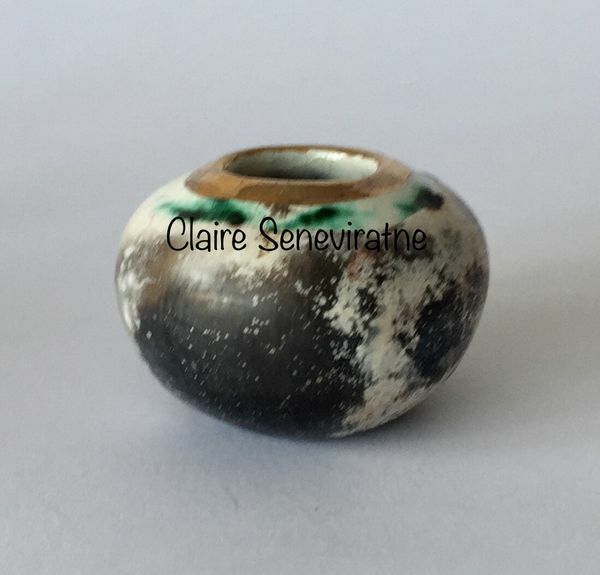 Small ceramic smoke fired pot with black and whire markings. Video 5. Small pinch blues. Video 6. Smoke fired porcelain pot with gold lustre. Video 7. Small gold lustre, smoke fired pot. Video 8 Smoke fired porcelain pot with gold lustre. Video 9. Porcelain smoke fired pot with gold lustre. Video 10. Ceramic pot with glaze and gold lustre. Video 11. Ceramic pot with gold lustre. Video 12. Upright smoke fired pot. Video 13. Ceramic pot with black and white. Video 14. Ceramic fine at pot. Smoke fired in sawdust. Video 15 Smoke fired with blue shades. Video 16 Ceramic smoke fired pot with gold and copper. Video 17 Small round smoke fired pot with gold and copper. Video 18 Small ceramic smoke fired pot with gold and copper. Video 19 Smoke fired pot with gold. Video 20 Smoke fired pot with gold. Video 21 Small ceramic pot with black and white. Video 22 Smoke fired pot with gold. Video 23 Smoke fired pot with gold. Video 24 Ceramic pot with black and white. Video 25 Ceramic pot with gold lustre. Video 26 Ceramic pot with gold lustre. Video 27 Ceramic pot with black and white. Meeting Keith Brymer Jones at the handmade fair Ragley hall. How to paint your snowman. How to make a clay lion. How to make a snowman with air drying clay. How to make a clay elephant. How to make a clay pig. How to paint a clay pig. Video 37. Ceramic fine art pot. Video 38. Tall smoke fired ceramic pot. Video 39 Ceramic pot with gold lustre. Video 40 Smoke fired porcelain vessel with gold lustre. Video 41 Ceramic pot with gold lustre. Video 42 Large round porcelain pot with gold lustre. Video 43 Large round smoke fired pot. Video 44. Ceramic pot smoke fired with gold and copper. Small smoked fired vessel with gold. This small ceramic pot has been made from porcelain, burnished prior to firing (smoothed with a piece of glass) and then partially glazed and fired in my electric kiln. I have used copper carbonate as a paint to add further textural markings to the surface. Next, the gold lustre has been added and fired on, again in the kiln. After the electric kiln firings the pot has been smoke fired in sawdust. The sawdust must be packed in a specific way and only a certain type of sawdust is used. Lastly it has been cleaned and waxed with beeswax.